Viveltre’s gourmet flavored coffee has stepped up the coffee game with the satisfyingly delicious Pecan Turtle coffee. 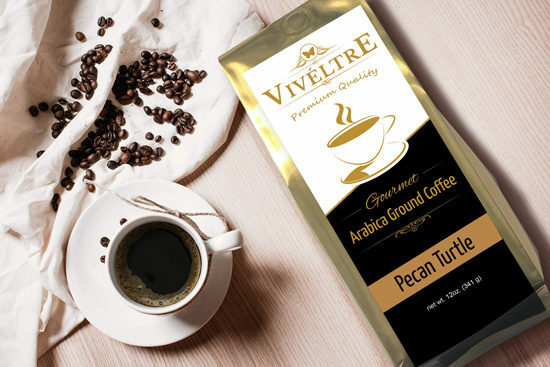 This light roast boasts notes of vanilla and chocolate, swirled with ribbons of caramel and finished off with toasted pecan. The aroma will enlighten your senses as the taste of pure Decadence takes over your tastebuds with every sip. Viveltre’s gourmet flavored coffees are brewed locally in small batches to ensure the highest quality and attention to detail. Viveltre is proud to use green coffee roasters to reduce our carbon footprint. All viveltre gourmet flavored coffees use a light roast of 100% Arabica beans.